Geeks on Tour is member supported! We don’t take advertising and we don’t sell any product other than our own teaching. This newsletter is free for all, and our weekly “What Does This Button Do?” show is free on Youtube. So what do you get when you sign up for a Premium Membership? I was using my Android smartphone and I was looking at the complete list of tutorial videos on the GeeksonTour.com website. Someone had asked for a link to the video about migrating from iPhoto to Picasa and I wanted to get the specific link to our video on that topic. If I was using a computer, I could go to our page where all the videos are listed and use the CTRL-F command to “Find” any text on that particular page. I could type iPhoto and find that video. But, I was using a smartphone, there is no way to do a CTRL-F on a smartphone. 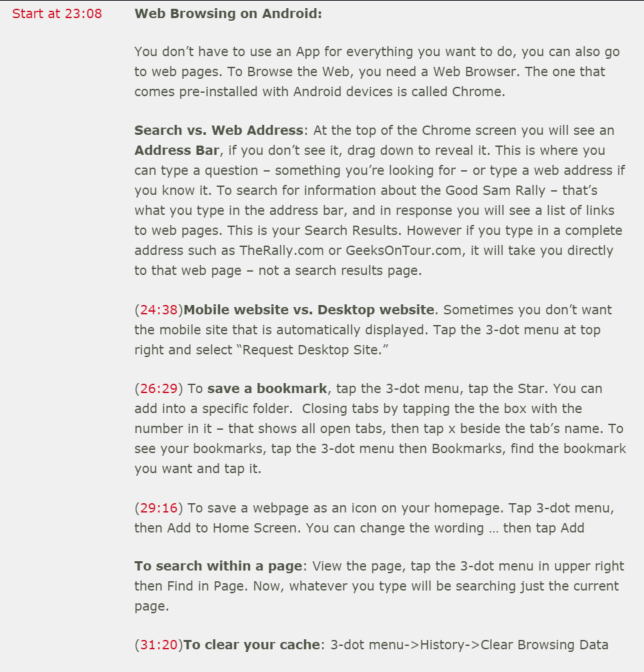 I remembered that we had done one of our weekly “What Does This Button Do?” shows on using web-browsers on smartphones, and we even covered how to search within a page using that browser. But, I didn’t remember how to do it! Notice the numbers in red. Those are direct timeline links to the places in the Youtube video where that particular topic is discussed. So, if you want to watch the video, you don’t have to watch the entire 45 minute show to get what you need. In my case, I didn’t even have to review the video because the info I was looking for was written out in the notes: “To search within a page: View the page, tap the 3-dot menu … Find in Page…” YES! That’s what I was looking for, and it worked great. Now if only I could improve my memory! Published by MrsGeek, in Blog. Tagged with #GeeksWhoTeach, #WDTBD, Android, Apps for Travelers, Droid, Geeks on Tour, GeeksOnTour.com Show Notes, iPad, iPhone, Membership Benefits, Show Notes, Smartphones, Weekly Show, What Does This Button Do?.